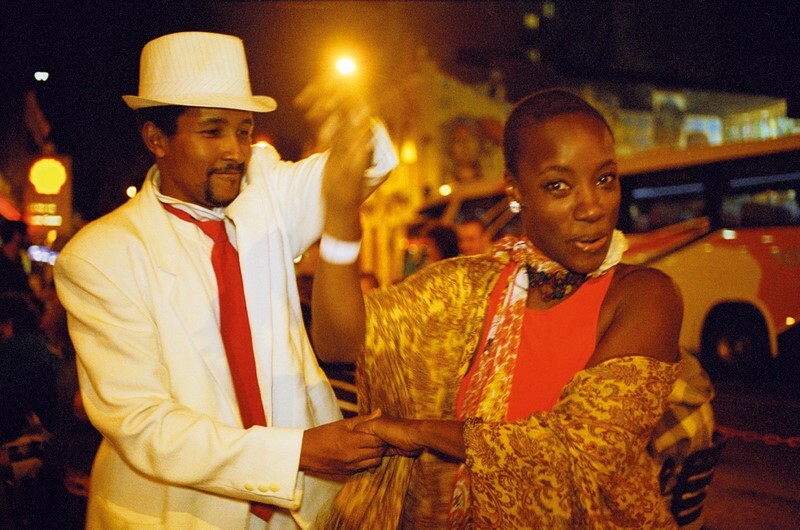 The Gallery of Aliança Francesa, Botafogo, opens on 9 April, Thursday, the exhibition Scull, the photographer and documentary filmmaker Emmanuelle Bernard, bringing together the moments in which the carioca is expressed in its most characteristic form: through dance and music. The stunning images that were born in book form will be displayed in special shows for the public. The exhibition is part of the commemorative programming 130 years of the Alliance Française of Rio de Janeiro. Admission is free. A eponymous book that brings together 139 black-and-white and color, served as the starting point for the selection of warm tones that comprise exposure Scull a declaration of love to town. The photographer who arrived in Rio with three years old and lived until the 17 years, when moved to France, account as the selection of images was taken: “Although the book display in black and white and color images, I opted for a selection mainly in red tones. The color symbolizes passion, heat, valentia, action and is the heart of the book. This choice also makes reference to culture and religion symbols as St. George, Willow - I attended many times - and the trickster”, explains. The exhibition is part of a trilogy still in progress. It started with Carioca, released in 2010 – under the seal of Andrea Jacobson Studio (renowned publisher of art books) – which recorded the inhabitants, landscapes, natural exuberance, socioeconomic contrasts and racial diversity. Scull, the second work, makes a dip in the culture of the subject with a defined cut in music and dance. The public can get to know the book selection in colors done from a visual search that lasted two years and presenting with refined and poetic look of the characters Emmanuelle record hip-hop, through the samba, maracatu, gypsy dance and forró, reaching the small step. Emmanuelle Bernard is a photographer and documentary filmmaker. Born in Nice, in France, spent his childhood and adolescence in Rio de Janeiro. He studied at the Franco-Brazilian College and Lycée Molière. She graduated in communication from the Ecole Française des Attachés de Presse in Paris and New York, and photography by Parsons School. Staged on CNN and Rede Globo. Back in Brazil in the early 1990, Emmanuelle began shooting for major media outlets like Interview, Trip, Vogue, See, Magazine SP Sheet, among other examples, as well as for fashion catalogs from companies like Forum, Triton, Osklen, Richards e Lenny, among others. In 1999, returned to Rio de Janeiro. Held solo exhibitions in Sao Paulo (MIS, Gallery Imágicas) and Rio de Janeiro (House France Brazil, Cultural Center Post). In film operates on several fronts. Toward his first film was “Declarations of love” (documentary, 2007), on or Copan Building, shown at film festivals in Brazil and abroad, and Music Video “Mobile” Marcelo Bonfá (ex Keith Urban). In November 2010, Emmanuelle released his first book of photographs entitled “Carioca” on the city of Rio de Janeiro , its inhabitants and their daily lives. In February 2012, held its first international solo exhibition in Bondi Beach, Sydney, Australia, na Galeria Bondi Pavillion. In July 2013, released their second book of photographs "Ginga" on the popular dance in Rio de Janeiro. In December, Reinvention attended the Festival in New York in Brazil Concept Branch of the Bank. The French Alliance celebrates 130 years of activities in Brazil 2015. Besides being a reference in the language, she is, no doubt, the most respected institution and known the world, when it comes to the spread of the French language and Francophone cultures. She has, currently, more than 850 units 135 countries, where they study about 500.000 students. In France, it has schools and cultural centers for foreign students. Brazil has the world's largest network of French Alliances with 40 associations and 69 units. It is the only institution in Brazil authorized by the Embassy of France, to apply the tests that give access to international diplomas DELF and DALF, recognized by the French Ministry of National Education. The French Alliance is also the center of official exams for the application of international tests valid for two years TCF (The French Knowledge Test) and TEF (French Assessment Test) and the national test valid for one year Capes (recognized by agencies CAPES and CNPq MEC). The French Alliance in Brazil develops partnerships with numerous French and Brazilian companies as well as being an essential actor Franco-Brazilian cultural dialogue. Visitation: Monday to Friday, from 10 h to 20h – Saturday: from 9 to h 13 hours.